Trucks carrying the coffins with the remains of Chapecoense soccer team members, victims of an air crash in Colombia, drive through the streets of Chapeco, Brazil, Saturday, Dec. 3, 2016. 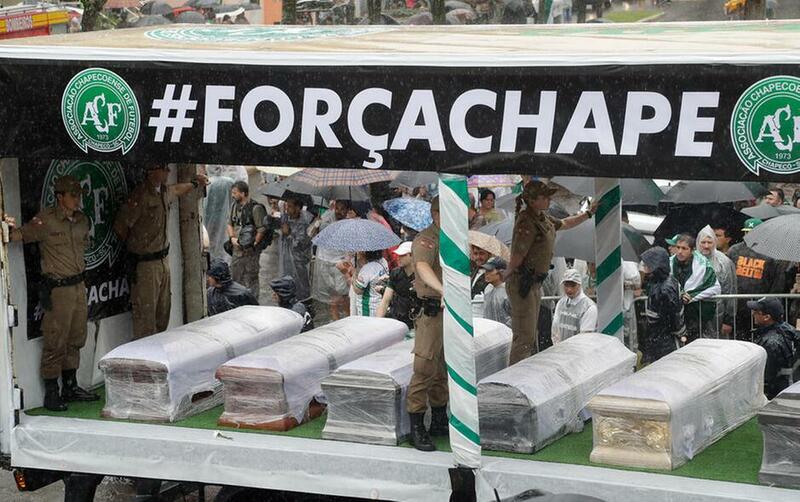 CHAPECO, BRAZIL (AP) — On a rainy Saturday that only accentuated the grief, 20,000 people filled a tiny stadium under umbrellas and plastic ponchos to say goodbye to members of the Chapecoense soccer club who died in a plane crash. Thousands also lined the roads as the coffins were driven in a procession from the airport to the stadium memorial. "I've been here since early morning," said 19-year-old Chaiane Lorenzetti, who said she worked at a local supermarket frequented by club players and officials. "I'll never see some of my clients again. It's a devastating day that will last forever." A tent, with the coffins placed underneath, stretched across the width of the soccer field. On top of the white tent, a sentence from the club's anthem was written for all to read. "In happiness and in the most difficult hours," it said. "You are always a winner." Family members and friends wept under the tents. Many hunched over the coffins with photos of the deceased placed on top or alongside as almost everything got splattered by the non-stop rain. 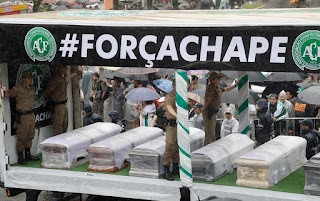 Brazilian President Michel Temer, who had not planned to visit the stadium for fear of being jeered, showed up after greeting the arrival of the bodies at the airport. He was treated respectfully and was joined by Gianni Infantino, the head of FIFA — the world governing body of soccer. "This is a time for pain and suffering, not for talking," Infantino said. "No words can diminish the suffering." Marco Polo Del Nero, the head of the Brazilian Football Confederation, was mildly applauded but also had insults shouted his way. Del Nero has been indicted by U.S. officials on corruption charges, although he has not been extradited. "You only came here because it's inside Brazil," one fan shouted, referring to the fact that Del Nero is likely to be arrested on a warrant if he leaves Brazil. Del Nero's predecessor, Jose Maria Marin, is under house arrest in the United States awaiting a trial. He was among top soccer officials arrested 18 months in raids in Switzerland. The loudest applause was probably for Brazil's new national team coach Adenor Leonardo Bacchi — known universally as Tite (pronounced Chi-Chi). He has led Brazil to six straight victories since taking over, quickly becoming a national hero. Ivan Tozzo, the acting president of the club, told fans the club would continue on, and reminded them that "it was here on this field where this club fought the good fight." "This team taught us that everything is possible," he added, recalling the team rose in less than a decade from the depths of Brazilian club soccer to the final of the No. 2 tournament on the soccer-crazed continent. In closing he added, "We are all Chapecoense." Chapeco Mayor Luciano Buligon, like several speakers, praised the aid Colombia provided — along with the club Atletico Nacional, the team Chapecoense was to play in the two-game final. "Atletico Nacional summed it all up on its website," the mayor said. "Atletico said Chapecoense came to Medellin with a dream, and it leaves a legend. Legends don't die." The stadium memorial came after a heart-wrenching week for residents and family members stunned by the crash. Hundreds of banners, flags and handwritten messages hung around the stadium — in Portuguese, Spanish and English. One sign in Spanish was aimed at Colombian officials who helped with the rescue. Six people survived, including three players. "Colombia, Thanks For Everything" it read. "They deserve a farewell of champions," said Tatiana Bruno, who stood inside the stadium in the rain, wearing a plastic poncho to stay dry. It wasn't clear exactly how many coffins were brought into the stadium, though television reports put a rough count at 50. Most of the people who died, including the 19 players, were not from Chapeco and were to be buried elsewhere. The rain let up at the end of the two-hour memorial, lifting some of the gloom. It also allowed family members and friends to circle the field, many with photos raised high of the deceased. Ahead of the memorial, the bodies arrived in Chapeco on overnight flights from Colombia. Staff at the Jardim do Eden cemetery, where some victims will be buried, said on Friday they were used to the business of death, but not a tragedy of this size. "We bury two people every day. I've done this job for a long time, but this is different," said Dirceu Correa, caretaker of the cemetery. "It is a tragedy for the families, for the club, and also for us because we are a part of the city."